Spring Forward, the delightful title work by Peter Schickele, is a gift to the composer/humorist’s many worldwide fans. This touching Suite represents a culmination of sorts “after a lifetime of entering sketches for such a piece into my notebooks,” Schickele writes in his entertaining program notes. Aaron Jay Kernis’ intriguing Perpetual Chaconne reflects his fascination with the variety of approaches composers have used to develop and vary their ideas over the ages. 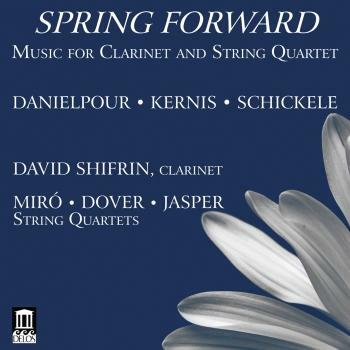 C"larinetist David Shifrin, whose work I’ve always liked, here presents three quintets by three different American composers with three different string quartets. The first is a serious work (if one can call any of his music really “serious”) by the multi-talented but wacky Peter Schickele, who has presided over the musical legacy of P.D.Q. Bach for the past 57 years. As in all of his own works I’ve heard, Schickele has a strong sense of form but also an predictable streak laden with humor, and Spring Forward is no exception. Lively rhythms, a touch of jazz and unpredictable twists and turns are all a part of his music, and all are on full display here. He even throws in a few harmonic dissonances for spice, though the second movement has a fairly straightforward harmonic progression and is quite lovely, albeit with a fairly lively middle section. The third movement, in particular, reveals Schickele’s humor in its odd distribution of meter and quirky development. After a brief (2:17), lyrical “Interlude,” we reach the jig-like finale, “A Perfect Picnic,” with its occasional out-of-tonality notes thrown in for flavor. For the most part, Richard Danielpour’s music is quite tonal and at times easily accessible. This quintet, however, subtitled “The Last Jew in Hamadan,” brings back memories of his childhood in that Iranian city that once had a fairly large Jewish population until the Ayatollah Khomeini took over in 1979 and began executing them, including one of Danielpour’s uncles. Another of his uncles was sent to prison but escaped, and a third fled to Turkey disguised as a mullah. The music is thus imbued with happiness, edginess, tragedy and hope; the first movement has a strong Eastern feel to it and is developed extremely well. The second begins in a more pastoral mood, so much so that it almost sounds like a discrete composition not necessarily tied to the first until the 4:30 mark when it suddenly picks up in a swift, dramatic passage before returning to the pastoral mood of the opening. The finale of this disc is Aaron Jay Kernis’ Perpetual Chaconne, which begins very slowly with falling figures played by the violins against the clarinet line. The music is tonal and pleasant but not mundane; around 3:30 the tempo picks up and the music develops in an unusual and striking manner, with the string lines becoming more complex and a gradual acceleration to add interest. Indeed, the music becomes ever more complex, particularly in rhythm, and more intense as it goes along, then decelerates to its original slow tempo for further development. In the final section, the faster tempo returns. One of only two wind players to have been awarded the Avery Fisher Prize since the award's inception in 1974, Mr. Shifrin is in constant demand as an orchestral soloist, recitalist and chamber music collaborator. Mr. Shifrin has appeared with the Philadelphia and Minnesota Orchestras and the Dallas, Seattle, Houston, Milwaukee, Detroit and Denver symphonies among many others in the US, and internationally with orchestras in Italy, Switzerland, Germany, Japan, Korea and Taiwan. In addition, he has served as principal clarinetist with the Cleveland Orchestra, American Symphony Orchestra (under Stokowski), the Honolulu and Dallas symphonies and the Los Angeles Chamber Orchestra and New York Chamber Symphony. Mr. Shifrin has also received critical acclaim as a recitalist, appearing at such venues as Alice Tully Hall, Weill Recital Hall and Zankel Hall at Carnegie Hall and the 92nd Street Y in New York City as well as the the Library of Congress in Washington D.C. A sought after a chamber musician, he collaborates frequently with such distinguished ensembles and artists as the Guarneri, Tokyo, and Emerson String Quartets, Wynton Marsalis, and pianists Emanuel Ax and André Watts. An artist member of the Chamber Music Society of Lincoln Center since 1989, David Shifrin served as its artistic director from 1992 to 2004. He has toured extensively throughout the US with CMSLC and appeared in several national television broadcasts on Live From Lincoln Center. He has also been the artistic director of Chamber Music Northwest in Portland, Oregon since 1981. David Shifrin joined the faculty at the Yale School of Music in 1987 and was appointed Artistic Director of the Chamber Music Society of Yale and Yale's annual concert series at Carnegie Hall in September 2008. He has also served on the faculties of The Juilliard School, University of Southern California, University of Michigan, Cleveland Institute of Music and the University of Hawaii. In 2007 he was awarded an honorary professorship at China's Central Conservatory in Beijing. Mr. Shifrin's recordings on Delos, DGG, Angel/EMI, Arabesque, BMG, SONY, and CRI have consistently garnered praise and awards. He has received three Grammy nominations - for a collaborative recording with the Chamber Music Society of Lincoln Center of the collected chamber music of Claude Debussy (Delos), the Copland Clarinet Concerto (Angel/EMI) and Ravel's Introduction and Allegro with Nancy Allen, Ransom Wilson, and the Tokyo String Quartet (Angel/EMI). His recording of the Mozart Clarinet Concerto with the Mostly Mozart Festival Orchestra, performed in its original version on a specially built basset clarinet, was named Record of the Year by Stereo Review. His latest recording, Shifrin Plays Schifrin (Aleph Records), is a collection of clarinet works by composer/conductor Lalo Schifrin. Both the recording of the Copland Clarinet Concerto and a 2008 recording of Leonard Bernstein's Clarinet Sonata with pianist Anne-Marie McDermott have been released on iTunes via Angel/EMI and Deutsche Grammophon. Mr. Shifrin continues to broaden the repertoire for clarinet and orchestra by commissioning and championing the works of 20th and 21st century American composers including, among others, John Adams, Joan Tower, Stephen Albert, Bruce Adolphe, Ezra Laderman, Lalo Schifrin, David Schiff, John Corigliano, Bright Sheng and Ellen Taaffe Zwilich. In addition to the Avery Fisher Prize, David Shifrin is the recipient of a Solo Recitalists' Fellowship from the National Endowment for the Arts and the 1998 Distinguished Alumnus Award from the Music Academy of the West. At the outset of his career, he won the top prize at both the Munich and the Geneva International Competitions. Mr. Shifrin resides in Connecticut with his wife and is the father of four children - Henry, Olivia, Sam and William.